Florida’s defense did not have its best game against Kentucky. There were indeed a lot of mistakes, and those did come through on the close rewatch for this film study piece. I am doing my best to stay clinical and precise in this review. I am calling it how I see it and not trying to single anyone out to tear them down. It’s just that in a game with as many errors as this one had, there are going to be some names mentioned for not doing the right thing. I noted last week that Florida used a mix of its 3-3-5 base and true 3-4. It used the 3-4 sets quite a bit more once Charleston Southern tried to get its option run game going. Against Kentucky, the Gators used very little 3-4 until the very end when UK was obviously trying to milk the clock with Benny Snell running the ball just about every play. And, even then, it wasn’t until the tail end of the second of three drives of nearly Snell-exclusive running that UF went heavier (including some 4-4 sets at the end). Florida only used true 3-4 fronts six times before that finishing stretch, usually against obvious run sets. That is not to say that Todd Grantham didn’t put up a big front against the run at times. He sometimes had a five-man front of three down linemen and a linebacker on each edge, not entirely dissimilar from his usual front when going with the 3-4. The difference is that with the five-man front from the 3-4, the two edge linebackers nearly always are guys who play the buck position. In the five-man front from the 3-3-5, one of the edge linebackers would be a buck like Jachai Polite but the other would be one of the non-buck guys like Rayshad Jackson. Often while doing that front, Grantham would have a safety like Donovan Stiner come up into essentially what is a linebacker spot next to the non-edge linebacker to give a seven-man box. I’ll have more on that last personnel choice later. There were hopes this offseason that the transition on the defensive side of the ball would go smoothly. UF had some defensive ends on hand who could be converted into the buck position without too much trouble, after all. 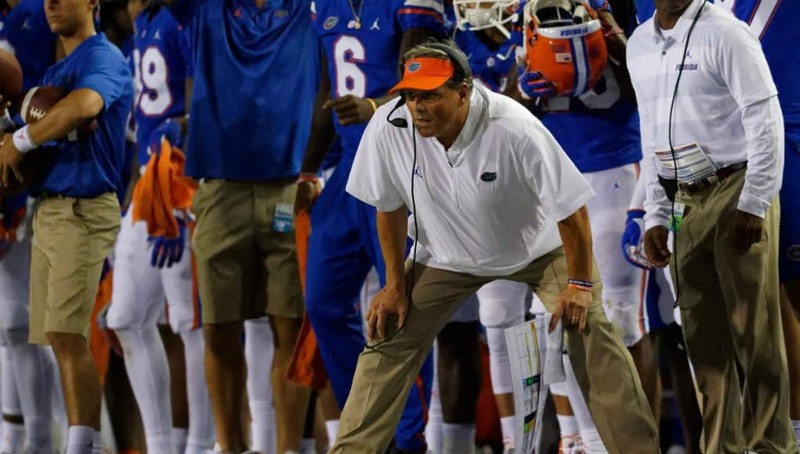 The thing is, it can take some time to master a scheme as different as Grantham’s is from Randy Shannon’s no matter how suited the personnel might be to the new one. There were some instances I found where I think we saw some of the first-year-in-a-new-system issues. The clearest example came on a 3rd & 6 in the middle of the second quarter. As Kentucky is settling into its formation, everyone on defense is standing up and talking to each other. They’re clearly trying to get everyone into the right place, but it’s hard to communicate because the crowd at the Swamp is deafening. Guys are making hand signals at each other right up to the snap. On the offense’s left side, a Kentucky receiver does a crossing route while the tight end heads up the sideline. Both the corner CJ Henderson and safety Jeawon Taylor follow after the crosser, leaving the tight end wide open. Polite ends up saving the day by pressuring UK quarterback Terry Wilson from the left, forcing him right in a way where he can’t hit the tight end. I believe it’s Taylor who blew that coverage on the offense’s left, but the safety on the other side Stiner doesn’t play it perfectly either. He tails the route that Chauncey Gardner-Johnson is covering rather than realize that Jackson is beat underneath, and he’s out of position to help on the tackle. Gardner-Johnson told the media that Kentucky played with an edge while the Gators merely “went through the motions”. I’m not sure if that’s a bad attempt at self-preservation — no really, if we only tried hard we definitely would have won — or it’s actually true, but the number of bad angles and tackles the defense had suggests there could be something to it. Angles are often about focus and tackling is a lot about effort. The safeties had a lot of issues with angles in particular, though they weren’t the only ones. Here is a play where Florida’s defensive front does its job in plugging run gaps — it shows good backfield penetration by TJ Slaton in particular, and the rewatch showed UF’s defensive tackles having a much better game overall than I thought watching live — but the safety Taylor is out of position and takes an angle that ends up preventing him from making the stop on a long Snell run. I think one potential factor with angles is that UK’s Wilson may have been faster than Florida expected. There isn’t a lot of good film on him because he redshirted his one year at Oregon and otherwise the only footage of him is from high school, JUCO, and against a Central Michigan team that just got hammered at home by Kansas. Here is a play where Polite takes too flat an angle in pursuit and Wilson beats him to the edge. Some of the bad angles on Wilson specifically could’ve been from that. Gardner-Johnson’s poor attempt at a tackle on that play had nothing to do with a lack of good film on Wilson, though. I’m not going to make a supercut of missed tackles because I don’t think that would serve anyone well, but I will say I counted 11 plays out of the 57 that UK ran that had at least one missed tackle by the Gator defense. That’s nearly one in five, and a handful of others had bad angles from various defenders. All but one missed tackle came from starters too, with the other coming from newly-minted starter Trey Dean following Marco Wilson’s ACL tear. It wasn’t the backups who were making these mistakes, though Jackson, a repeat offender, will likely go back to being a reserve once David Reese II is healthy again. In some ways, Florida merely going through the motions against the Wildcats would be the best-case scenario. Otherwise, it means the front line of the defense is stocked with guys who don’t know which angles to take and can’t make proper tackles consistently. Florida’s linebackers weren’t good in pass coverage last year. They aren’t good at it this year, either. We got to see that on the game’s first drive. The innermost receiver to the quarterback’s right runs two yards past the line of scrimmage and stops to catch the pass. Both Jackson and Vosean Joseph overrun the receiver, and what should be a two or three yard gain becomes a nine-yard gain. I think it’s for this reason why Florida stayed in its 3-3-5 base much of the game despite UK’s success running the ball. Grantham did employ a fair number of five-man fronts, but as I described above, it was still in the nickel with a guy like Stiner essentially playing linebacker. Stiner is better than Florida’s linebackers at coverage, so it makes sense on that level. The thing, though, is that fixing the linebacker pass coverage problem created a new one of not being as effective as they could be against the run. Here are two examples. On this play Florida has three down linemen, the buck Polite on the offense’s right edge, and Jackson on the left edge. The two players in what you’d think of as linebacker spots are Joseph and the safety Stiner. If this was a true 3-4 set, Jackson would be where Stiner is and another buck like Jeremiah Moon would be on the edge where Jackson is. Jackson is a little lucky that the tight end ignores him, giving him a free shot at the back. He misses the tackle, however, leading to a nine-yard gain abetted by a separate poor tackling attempt from Henderson. In a true 3-4 set, a more sure tackler would’ve been there instead of Jackson. On this other play, it’s the same five-man front with three linemen, a buck on the near side in Moon, and a non-buck linebacker on the far edge in James Houston. UF starts by showing two deep safeties, but Stiner comes up to the linebacker level just before the snap. The Kentucky center comes up to block the second level. In trying to avoid him, Stiner, who as a safety is a good 30-40 pounds lighter than a linebacker who might’ve been in that spot instead, ends up running into the back of Houston and immediately goes down. He falls directly behind Houston, tripping him up and allowing Snell to get extra yardage. There even was a play a little later on when Henderson, who is visibly the slightest starter on the defense, is in playing the pseudo-linebacker spot. He does about as well as could be expected while being blocked by a 305-pound guard, but he gets driven backwards the entire way because he’s more than 100 pounds lighter than the guy blocking him. The roster is what it is at this point, and so the coaches will have to decide which tradeoffs are worth it.